Ford's ultra-capable Super Duty pickups excel at big-time towing and hauling but also can pamper up to six people in leather-lined luxury. The 2013 ford f350 super duty crew cab electric vehicle qualifies for a federal tax credit of up to $7,500, effectively reducing the net base price. Despite the headlines about higher fuel prices and the popularizing of smaller cars, there is still a place for mighty trucks that can perform mighty tasks. Those who drive such vehicles are more apt to be wearing work gloves and overalls than cufflinks and khakis, and almost without question they'll be seated in a vehicle from the domestic Big Three. To this end, the 2013 Ford F-Series Super duty has only three major opponents: the Chevrolet Silverado HD/GMC Sierra HD twins, and the Ram 2500/3500. Like its competitors, the Ford Super Duty offers powerful gasoline or diesel engines that can haul enormous loads. With a vast range of models and tremendous towing and payload capacity, the Super Duty is a truck born for work. Massive power is a given for Ford's brawniest passenger truck, but today's Super Duty trucks also offer plenty of pampering. The new Platinum trim, for example, includes a heated, leather-wrapped steering wheel, while Ford's Sync infotainment system and 8-inch high-resolution display can help you play hard, too. If you like the image of yourself in a big, tough truck but don't intend to haul anything more than some dirt bikes, a sofa or a small boat, a light-duty truck such as the F-150 starts at a lower price and can save you in fuel costs. If want a manual transmission in your heavy-duty truck, look to a Ram. Braking capability and payload and towing capacity have been increased in what seems a never-ending quest for bragging rights in the heavy-duty truck segment. The 2013 F-Series Super Duty can now conventionally tow up to 18,500 pounds, and has a maximum 5th-wheel trailer tow rating of 24,700 pounds. Also new are the Platinum trim and availability of the Sync infotainment system with MyFord Touch. Aside from horsepower and torque – both of which are had in prodigious amounts in the Super Duty – one of the most important features in a truck is its body strength. The Super Duty has that, too, in a stiff chassis that features fully boxed front frame rails and thick C-channel frame rails and crossmembers. All these traits help the Super Duty avoid flexing and twisting, and improve its towing capacity. For such a mammoth vehicle, the Ford Super Duty is stable, sturdy, and quite easy to drive. The cabin is quiet, steering is firm and direct, and the brakes feel strong. Those who like to boast about the numbers can brag about the 800 lb-ft of torque churned out by the 6.7-liter Power Stroke turbodiesel that enables the Super Duty to tow 18,500 pounds in conventional towing, and 24,700 pounds in a 5th-wheel setup. The idea of keeping your eyes on the road when making phone calls or getting directions from a nav system is important in general, and is perhaps even more so in a truck such as this, where workers are often in communication with others or traveling to new places. This system even has a feature that reads incoming text messages. Heated and cooled seats and a leather steering wheel that warms your hands may sound like features form a luxury vehicle, but they're available in the Super Duty series. As you might expect in a vehicle whose trims and prices range so widely – from just over $30,000 for a basic F-250 XL trim to nearly $70,000 for an F-450 Platinum edition – the 2013 Ford Super Duty's cabin ranges from Spartan to luxurious. In regular-cab form, seating is limited to three passengers. Crew cab and super cab models can seat up to six passengers, or five when equipped with two individual front seats and a center console. Lower-trim models have basic vinyl seating that can take a beating and clean up easily, while premium leather can be had on the other end of the Super Duty spectrum. Ford's Super Duty trucks exude their big and brawny nature, from the massive front grille to the equally large tailgate stamped with "SUPER DUTY" on the bottom. These trucks can be configured with 6-and-3/4-foot or 8-foot beds, and with regular, super cab, or crew cabins. F-450 models come with two pairs of rear wheels that enable it to carry extreme loads. It's safe to call even the smallest of the Super Duty models large. A regular-cab model, which is fitted with an 8-foot bed and qualifies as the shortest, is 227.6 inches in length, while the longest comes in at 263 inches. At nearly 22 feet, that latter model is nearly seven feet longer than a Honda Civic. If you plan to park this truck in your garage, take some measurements first. As mentioned with the interior, what you get in your Super Duty varies greatly on trim. On the lower end of the spectrum, XL models are Spartan and definitely work-oriented with heavy-duty vinyl seats, manual-control air conditioning, and an audio system limited to an AM/FM radio with two speakers. A CD player is optional in that trim, as are cruise control and power windows. The standard engine on F-250 and 350 models is Ford's 6.2-liter gasoline V8, while F-450 models get the 6.7-liter V8 diesel. Upper trims have equipment such as heated and cooled premium leather seats, a navigation system and a Sony premium audio system. All Super Duty trucks feature trailer sway control and roll stability control. Optional on all F-250 and F-350 Super Duty trucks is the 6.7-liter Power Stroke V8 turbodiesel whose power just might give gravity a run for its money. Other options vary with trim level, and many are geared toward the duties for which you plan to use your truck. An extra-heavy-duty alternator is available, as is an engine block heater. Models with diesel engines can be equipped with a Live Drive Power Takeoff to run auxiliary equipment such as a snowplow, truck lift, or cement mixer. Tow-prep packages for traditional hitches and 5th-wheel setups are available, and Super Duty trucks with the diesel engine have an exhaust brake feature like the kind used in big rigs when descending steep grades. The 2013 Super Duty is available with two V8 engines, a 6.2-liter gasoline unit that is the base powerplant or, for those needing maximum power, a 6.7-liter Power Stroke turbodiesel. Both are fitted to a 6-speed automatic transmission and can be had in 2-wheel drive or 4-wheel drive. Models with the gasoline engine run on regular unleaded and are also E85 compatible. An option package can make the Super Duty's gasoline engine capable of running on compressed natural gas (CNG) or liquefied petroleum gas (LPG), but does not include the fuel tanks or other equipment. In diesel models, Ford says nitrogen oxide levels are reduced more than 80 percent vs. previous generations. The EPA does not give fuel-economy ratings for either of these engines. 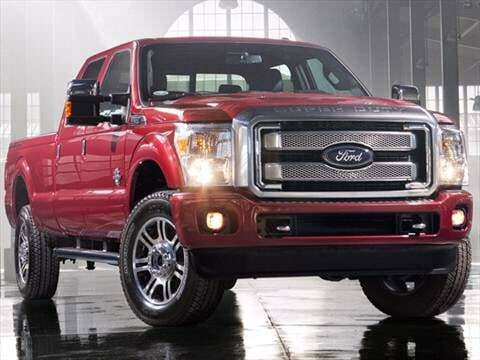 There's a 2013 Ford Super Duty truck to meet a variety of budgets. At the low end of the spectrum, a 2-wheel-drive F-250 XL has a Manufacturer's Suggested Retail Price (MSRP) starting just over $30,000. On the other end, a Platinum edition F-450 starts at over $68,000 and can cross the $70,000 mark with options. On F-250 and F-350 models, the diesel engine is roughly $8,000 extra (it's standard on the F-450). At its base price, the Super Duty is competitive with its Ram and GMC/Chevy rivals. Before buying, be sure to check the Fair Purchase Price to see what other contractors in your area are paying for the 2013 Ford Super Duty. Looking down the road, the Super Duty's resale value also is roughly in line with its competitors and varies slightly depending on model and cab configuration. Models equipped with the diesel engine tend to have a slightly higher resale value than those with the gasoline engine. Amazing power and comfort, Best truck on the road. Couldnt be happier with our big F350 Super Duty Lariat 4x4 dually with the Lariat Package and the 4.30 rear axle. Love this truck. Best heavy duty 4x4 diesel truck.